Nordic walking can be a disappointingly affordable sport. Disappointing because, aside from good footwear which you should have anyway, there are very few add-ons that you can buy in your new-found enthusiasm for the sport, forcing you to get out and do the darn sport rather than shop for it. Some of the accessories, like the boots and the baskets that you will learn about shortly, may be interchangeable between makes of Nordic poles. I say “may” because there are two different makes of Nordic poles in the house now, and they happen to be, perhaps by luck, interchangeable between those two makes. Many of the accessories are mysterious. Neither of the two makes here came with any “user manual”, not even a small leaflet written in English badly translated from Goblin that might explain what the bits were, when to use them and how to put them together. It was very hard to Google what an item was for when you didn’t know what it was so I just had to suss it out over time. Now, you won’t have to, because I have. 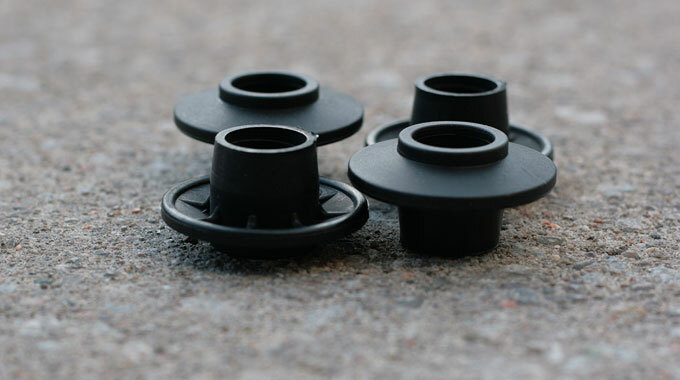 These hard rubber boots go onto / over the hardened metal tips at the end of your poles. While you might look like a dork doing Nordic walking, the purpose of these booties is to prevent you from also sounding like one by muffling the loud “click click click” sound on hard surfaces that the pole ends would otherwise make. There is more to the rubber booties than that, though. Much more. 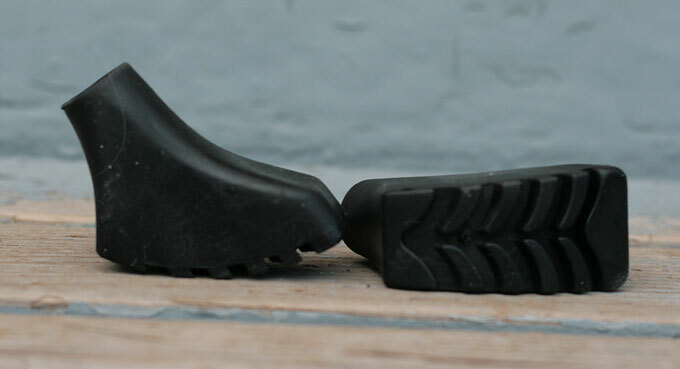 The bottom treads help provide some stability on damp or slippery surfaces. 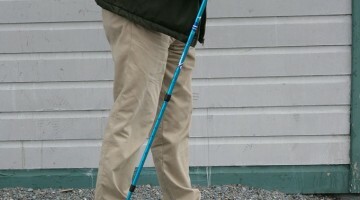 Your first pair of booties will almost always come included with your purchase of a set of Nordic walking poles. They will be angled at the bottom. If you got ones that are straight at the bottom, you may have bought trekking poles instead of Nordic poles. When you order a pair of booties, you’re best, I’d say, to order two or three pair at a time, in order to always have a spare pair on hand. As they wear out and the rubber gets thin, they will be prone to flying off and getting lost. Or, the treads will wear out and your poles will start slipping on wet leaves. Or, one will just suddenly split on you during a vigorous session, or, the bottom of one bootie will be so worn down that the metal tip of that pole will emerge through the bottom and slowly but surely you’ll be walking with the dreaded “click click click” sound. It’s a very satisfying feeling when you are norking with a brand new pair of booties. Like the booties, your first pair of performance baskets will almost always come included with your purchase of a set of Nordic walking poles. You screw them onto (or over, I guess) the ends of your pole; they will ride about 2 to 3 inches (5 to 7 1/2 cm) up the pole from the tip (depending on the make.) There’s room for both the basket and the bootie (or the plain tip) at the end of the pole. This picture below shows both scenarios (tip and booty) better than I could explain. The performance baskets apparently help you in loose soil, as well as keeping your trekking pole from getting wedged between rocks or tangled in damp grass or debris. … which I haven’t been mad enough yet to do as cutting across that expanse of sand with Nordic walking poles looks like a LOT of work, would you not agree? I’ve seen these called “snow baskets”, or “snow flake baskets.” They come included with some brands of Nordic walking poles; with others they are an optional accessory purchase. While the performance baskets are designed to stop your poles from sinking into soft soil, these (which are much wider) are designed to stop your poles sinking too far into heavy snow. I’m not sure why there are holes in the design; at first blush, you’d be tempted to think that a completely solid disk would give better support. 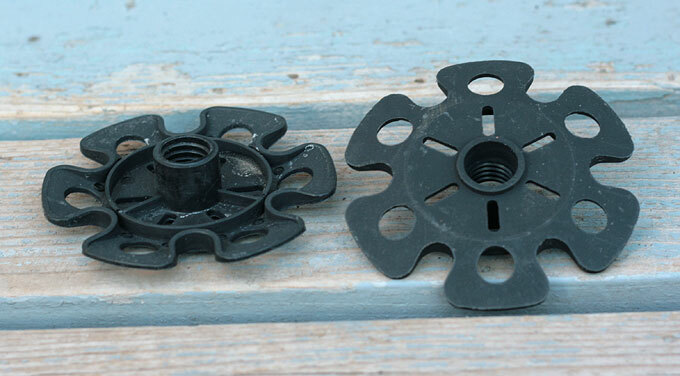 I cover these (and how useful I thought they were) in my post on Nordic winter walking. At any rate, they look kewl; I’d get them if I were you on that basis alone. Whether you need this type of accessory or no will depend completely on what type of pole you have. 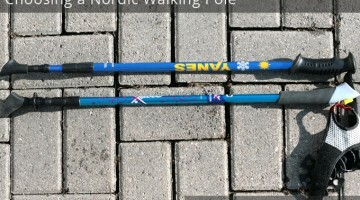 Not all Nordic poles have straps; not all Nordic poles with straps have detachable straps. 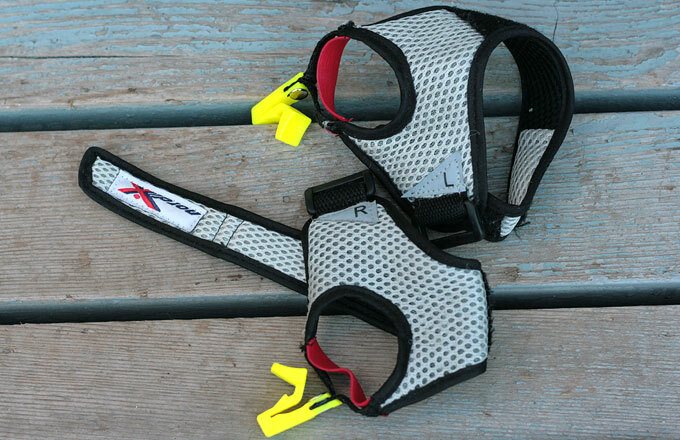 Note that there is a (L)eft one and a (R)ight one, clearly marked because they are not swappable. They seal up with velcro around your wrist in a really unique fashion that you just have to figure out, and have a breathable mesh finish like racing car driver gloves. In short, they are really kewl to have. Granted this is what I started out norking with, so it’s what I know best, but regardless, I would still say the “kewl factor” is high on these. I was a massive jogger in the 1980s, when there was no such concept as “visibility”. 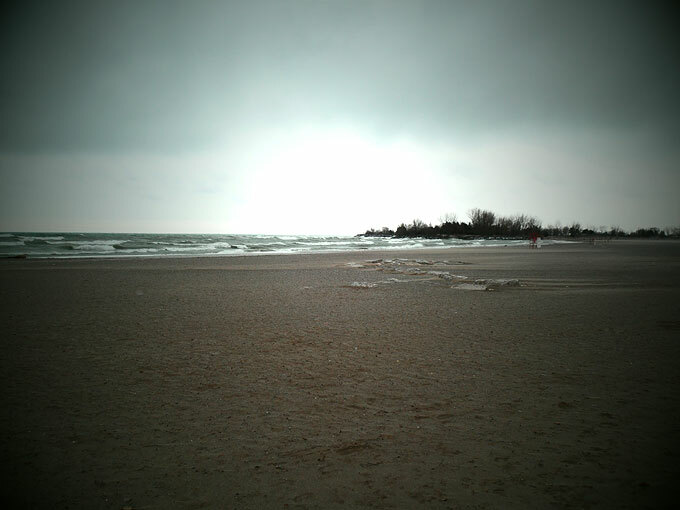 (Back then, a car hit you running on the side of the gravel road at night, or didn’t, and you lived, or not. Simpler times.) Then I started my own business and a few decades went by, and now I’m back to being fit. In between a concept called “visibility at night” developed that didn’t exist earlier. 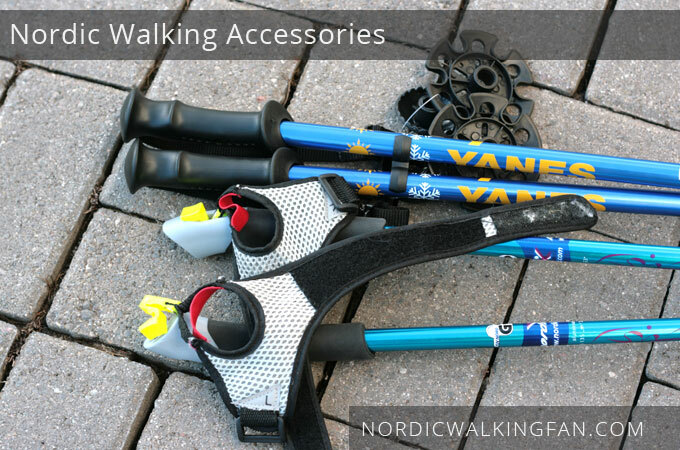 This is something that not all Nordic walking stores don’t seem to talk about or sell you, and they should. Visibility. 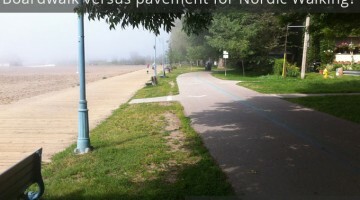 When you are out norking, you are most vulnerable at that time of day that the French call “la crépescule” and the Québecois call “la brume” (the fog). It’s the time of day when for a few minutes between late afternoon and early dusk, there’s a sort of misty grey fog in the angle of the light and the eye isn’t quite sure of what it sees. One evening at that exact time of day a woman cyclist who had just passed me on the fitness trail stopped and said, “OMG you know I just veered a bit over from you on a weird instinct; I would have hit you otherwise because I didn’t actually see you till after; you were so not visible.” I bow to her. Lesson delivered clearly, politely, no judgement. So my hunt began on how to be visible. Boy, visibility can cost a lot, and you wonder, really? It has to cost that much? So I went through a few weeks of being super careful at twilight while I gave myself time to research the topic. In the end, these bands pictured above were the answer — for me anyway. Two for five bucks. The slim silver batteries in them are replaceable (I hate throwing stuff out.) They didn’t crack in the extreme cold of winter, as I feared they would. Solid light or blinking light. Really versatile — adjust with velcro, strap them over all kinds of areas of your body or ring them through a belt, scarf or a headband. 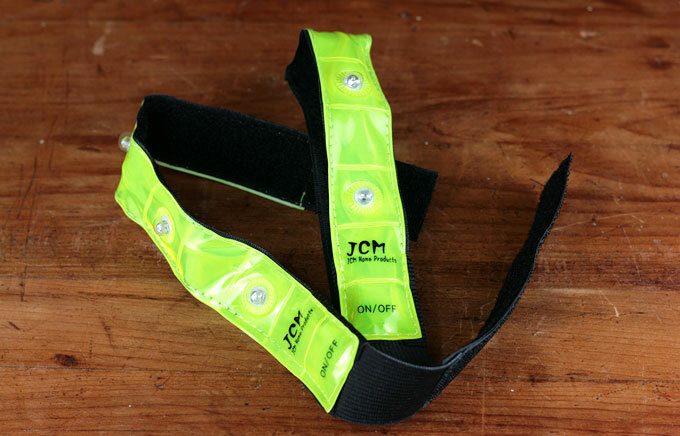 You’ll look like a dork with them on — but then, remember, they ain’t gonna notice the flashing safety light bands — you’re the one with Nordic walking poles in your hands. 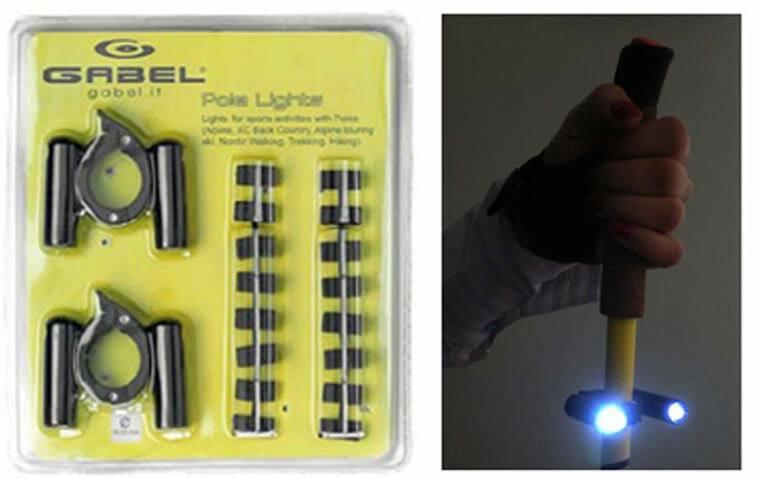 I’ve discovered since that there’s such as thing as Gabel Pole Lights (link valid as of March 2014); with any luck, they or something like them will be available in Canada because they also look KEWL!